Photo by KEVIN FULLER A flight of cider at Blue Toad. The cidery sources its ingredients from Schutt's Apple Mill in Webster and The Apple Farm in Victor. Photo by KEVIN FULLER Bartender Adam Washbon pours a cider at Blue Toad's tasting room. Thursday, 5 p.m. to 9 p.m.; Friday, 3 p.m. to 9 p.m.; Saturday, 12 p.m. to 8 p.m.; Sunday, 12 p.m. to 6 p.m.
Ciders, while delicious, are not necessarily known for a balance in their flavors. Mass-produced cider can be sickeningly sweet for some palates. On the opposite end, artisanal ciders can be off-puttingly dry to those expecting more traditional apple notes. The "farm license" trend in New York State has grown stronger in the last few years. Notable, burgeoning establishments include Honeoye Falls Distillery and Swiftwater Brewing Company, with their focuses on spirits and beer, respectively. Blue Toad Hard Cider — which sources all of its apples from Schutt's Apple Mill in Webster and The Apple Farm in Victor — represents another Rochester development in the move toward homegrown alcohol. Blue Toad is the brainchild of three friends, Greg Booth, Scott Hallock, and Todd Rath, all from Wheatland-Chili High School, whose interests in craft brewing cider spurred them to open the cidery in January 2015. The name came from a pub Rath had owned in Virginia, with its nod to the majestic Blue Ridge Mountains and Rath's old nickname, "Toad." While the original pub is no longer in business, Blue Toad Hard Cider has operations and a tasting room in the southern state. All of Blue Toad's ciders are produced with an eye toward what bartender Adam Washbon refers to as "clarity" — a lack of impurities that results in a clearer appearance and a crisper taste. The cider arrives fully pressed from the farms, and the fermentation begins. During fermentation, however, the process is halted, and the cider is force-filtered four times. "It produces a clean product quickly," Washbon says. "The goal of Blue Toad as a cidery is to be 'sessionable.'" Almost across the board, Blue Toad's offerings attempt to split the difference with less-filling, semi-dry ciders that emphasize crisp and clean over candy-like sweetness or acrid inaccessibility. Some of the cidery's options are more successful than others. ROC HARD Amber (5.5 percent ABV) — one of Blue Toad's flagship beverages and a 2016 World Cider Championships silver medal winner — achieved the best balance between tartness and sweetness. Made with Ida Red, Northern Spy, and Red Delicious apples, the amber was also the Toad's most full-bodied cider, with an effervescent quality that kept it light. Of all the ciders on tap, it had the broadest appeal and the most satisfying taste. Contrasting the amber, the Flower City Blonde — also a 2016 silver medalist — was much drier. Billed as a cider for wine drinkers, this combination of Crispin, Empire, and Golden Delicious apples had pear-like color, with a light presence that faded smoothly after the initial puckering on the tongue. The first of the Blue Toad ciders to be canned, the cidery sees the blonde as an ideal summer option. Pleasant, if underwhelming, the drink is a bit polarizing; it's a great fit for dry cider aficionados, but those searching for some sweetness need to look elsewhere. Despite the blonde's aspirations as a lazy-day, porch-sipping cider, the APA Triple Hopped cider (5.5 percent ABV) was easily the most "sessionable" of all the Blue Toad selections. The Sorachi Ace hops used in the cider were cold-steeped for five days. The resulting taste features an ample amount of lemon, but the hops were so subtle in the mix that they nearly went unnoticed. The most forgettable among the Toads was the Black Cherry, checking in at 6 percent ABV. Far from anything offensive, this cider looks like a white zinfandel. The initial, mild sweetness of cherry dissolves quickly, and has a similar finish to that of the Flour City Blonde. Perhaps the cider that best encapsulated the semi-dry aesthetic was the 5.5 percent ABV Paddy Green, a timely arrival for St. Patrick's Day. The seasonal cider had an absinthe green color, but a taste that was both slightly sugary and ever-so-sour. 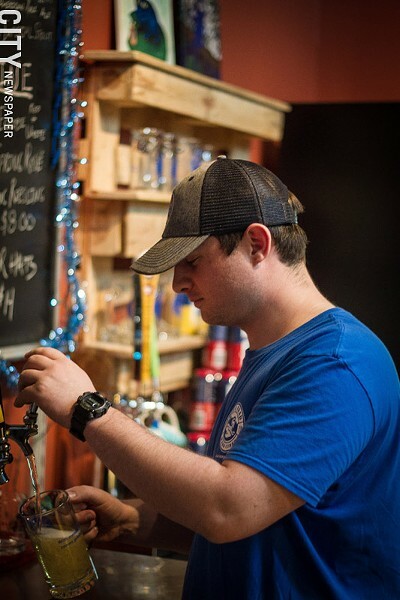 In addition to its signature and seasonal ciders, Blue Toad also offers a "guest tap" cider (at the time of my visit, it was Nine Pin), as well as Upstate New York wines from the likes of Keuka Spring Vineyards and Heron Hill Winery, and beer from Syracuse-based Empire Brewing Company. A particular laudable Blue Toad project is its set of three cocktails ($8 per drink), which feature collaborations between the cidery, Black Button Distilling, and Fee Brothers. I tried the Honey Crisp, which combined the ROC HARD Amber with barrel-aged gin, rhubarb bitters, and honey syrup. The cocktail was almost too easy to drink. The cider and the honey syrup melded well with the gin, lending a sweet-and-smooth combination that was hard to put down. Be on the lookout for new cocktails featuring Honeoye Falls Distillery's bourbon whiskey in the near future. 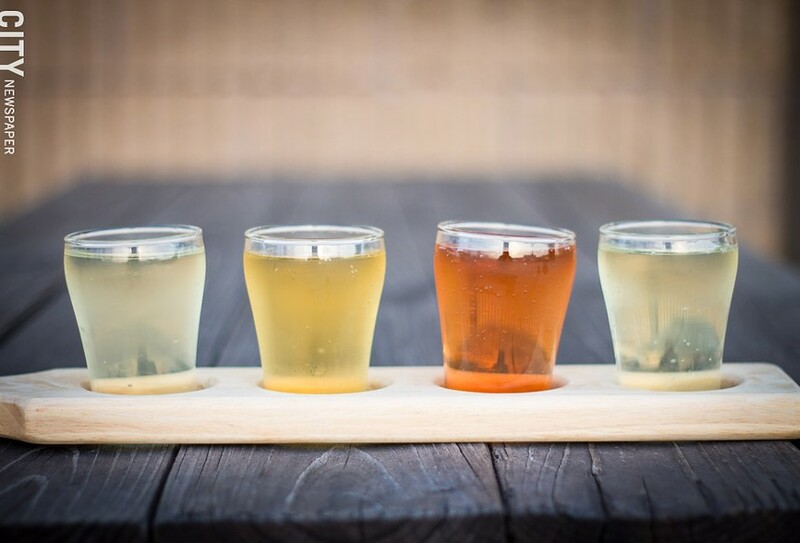 Cider flights range from $5.50 to $11, while all Blue Toad pints cost between $4.50 and $5.50. While not all of Blue Toad's ciders are created equal, the cidery excels in making drinks you'll be happy to enjoy all afternoon and evening long — especially as the warmer months arrive.